WILLIAMSTOWN — When Chita Rivera praises her co-workers, her endorsement carries a lot of weight. After all, the much-loved stage veteran owns a sterling resume, including a turn as the original Anita in “West Side Story” and membership in the original Broadway casts of “Bye Bye Birdie,” “Chicago,” and “Kiss of the Spider Woman.” She’s accrued nine Tony Award nominations, and won twice. Pointing to the rehearsal room where she’s been working the past few weeks, she seems to get a lump in her throat. 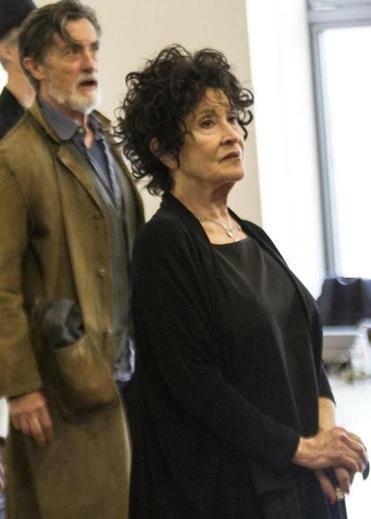 She’s sitting alongside castmate Roger Rees and their director, John Doyle, in a back hallway of the ’62 Center for Theatre and Dance at Williams College. The building houses the Williamstown Theatre Festival’s main stage, where “The Visit” is set to begin performances July 31. Adding to the poignancy is the fact that the music and lyrics for “The Visit” were written by the celebrated duo of John Kander and Fred Ebb, with whose work Rivera has had a particularly fruitful artistic relationship. (Ebb died in 2004.) Kander and book-writer Terrence McNally are on hand in Williamstown, making adjustments to the script on the fly. Graciela Daniele is the choreographer. Though “The Visit” has been kicking around in varying forms since 2000, the mood here feels like that of a team working on a brand new show. Doyle worked with Kander and McNally to create a new cut, streamlining it into one act of approximately 100 minutes. Doyle, who won a Tony Award for his direction of the 2005 remount of “Sweeney Todd,” also seems moved by the process. He describes Kander — who has long since earned the right to rest on his laurels, especially with respect to an older piece like this one — improvising changes to the score in rehearsal. Rees, who owns a Tony Award of his own and is familiar to television audiences from recurring roles on “Cheers” and “The West Wing,” was himself artistic director at Williamstown Theatre Festival for three years. The production history of “The Visit” is filled with starts and stops. It was originally developed as a showcase for Angela Lansbury, who withdrew from the show when her husband grew ill. With Rivera installed as the lead, a run in Chicago was booked for 2001 and meant to precede a turn on Broadway. But opening night fell only a few weeks after the Sept. 11 attacks, and momentum for a New York transfer fizzled. Based on a 1956 play by Friedrich Dürrenmatt, the musical tells a dark story about the enigmatic character Claire Zachanassian, described as the richest woman in the world. Played here by Rivera, Claire succinctly explains how she earned her riches: “I married very often, and I widowed very well.” The story centers on her long-awaited return to her impoverished hometown, where she offers the locals a large fortune in exchange for killing the shopkeeper Anton, who betrayed her many years ago. Doyle says the songs in “The Visit” provide a chance for the softer side of some less-than-likable characters to emerge. “I’m very interested in what makes human beings tick, and a lot of what makes us tick is not sunny. A lot of it is dark, if we can admit to it,” he says. Adding to the poignancy is the fact that the music and lyrics are by John Kander and Fred Ebb, with whose work Rivera has had a fruitful artistic relationship. Rivera says she believes in this show, and the fact is borne out by her repeated returns to it. But she has no comment on whether the third time will be the charm, finally prompting a maiden trip to New York.